Iran has substantially lowered the death toll in the earthquake that devastated the south-eastern city of Bam last year, cutting the fatalities by more than a third. The head of the State Statistics Centre Abbas Ali Zaali said that 26,271 people died in the quake of magnitude 6.6 that flattened most of the city on December 26, state radio reported. Officials had previously said more than 41,000 people were killed. A big reason for this discrepancy is that some of the dead were counted twice due to the confusion following the quake,. the radio quoted Zaali as saying. Zaali said 525 people were still listed as missing from the quake, and more than 9,000 people were injured. The ancient, pre-Islamic Arg-i-Bam or Citadel of Bam, founded more than 2,000 years ago and a United Nations world heritage site made of mud bricks, clay and straw, was flattened. "The historic quarter of Bam has been completely destroyed and many of our countrymen are underneath the ruins," said Mohammad Ali Karimi, the governor of Kerman province, where Bam, 600 miles south-east of Teheran, is located on the edge of the Lut desert. A magnitude 6.6 quake struck the southeastern city of Bam on December 26, killing an estimated 43,000 people and destroying a 2,000 year-old fortress near the city. Iranian authorities ended general search-and-rescue operations on Jan 2, 2004, despite the rescue of a 97-year-old Shahrbanoo Mazandarani after 8 days under the rubbles. On January 8, Thirteen days after being buried underneath earthquake rubble, a 56-year old man was found alive but in poor health in the southeastern Iranian city of Bam, an International Red Crescent spokesman said. Aid workers told Reuters the rescued man had travelled from a nearby village to Bam for medical treatment and was staying with his sister when the earthquake struck. Relief workers from Iran and more than 60 countries have been trying to help tens of thousands of survivors who are homeless and without basic necessities. Local people have told reporters that on the afternoon of the 25th of December there were some light tremors in the area but this would not be unusual for the region. Friday is not a working day in Iran so many people came home for the weekend on the evening of Thursday the 25th of December. At around 4am on Friday the 26th there was an earthquake, which shook houses. Some people got up and went out into the street but after a short period they returned to their beds. Then at 5.27am the second earthquake struck. 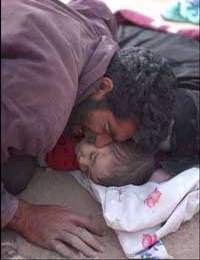 It measure 6.6 on the Richter scale and the epicentre was the city of Bam. Given the level of destruction it is probably safe to assume that the earthquake occurred close to the surface. Buildings collapsed. Roofs and ceilings tend to be made of many layers of bricks to keep the house cool in summer. These collapsed immediately burying tens of thousands of people under tons of rubble. 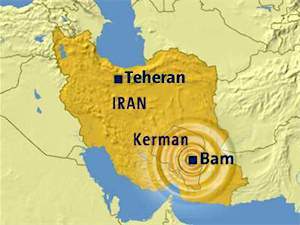 Bam is located in South-eastern corner Kerman province. Maintaining its position in the middle of the Southern trade route, this small-fortified city on the outskirts of the vast Dasht-i-L.t desert is just 350km west of the modern day Pakistan and 450km north of the Persian Gulf. Whether you are heading in either direction, Bam is an ideal place to stop for rest. Located in southeastern Iran, 200 kilometers south of Kerman, the ancient city of Arg-e-Bam is made entirely of mud bricks, clay, straw and the trunks of palm trees. The city was originally founded during the Sassanian period (224-637 AD) and while some of the surviving structures date from before the 12th century, most of what remains was built during the Safavid period (1502-1722). During Safavid times, the city occupied six square kilometers, was surrounded by a rampart with 38 towers, and had between 9000 and 13,000 inhabitants. 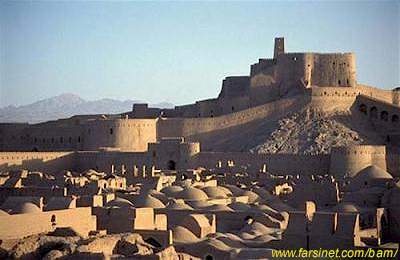 Bam prospered because of pilgrims visiting its Zoroastrian fire temple (dating to early Sassanian times) and as a commercial and trading center on the famous Silk Road. Upon the site of the Zoroastrian temple the Jame Mosque was built during the Saffarian period (866-903 AD) and adjacent to this mosque is the tomb of Mirza Naiim, a mystic and astronomer who lived three hundred years ago. Bam declined in importance following an invasion by Afghans in 1722 and another by invaders from the region of Shiraz in 1810. The city was used as a barracks for the army until 1932 and then completely abandoned. Intensive restoration work began in 1953 and continued till the earthquake. Ancient Bam, or the Arg-i-Bam, at its peak of political, economic, and military power had some 11,000 citizens living in 400 houses within its city walls, which still stand much the way they did hundreds of years ago. Since the city's inception, judged to be between 250 BC . 224 AD, Bam has thrived as an energetic market place and a focal point for the region. It was not until a devastating Afghan invasion in 1722, which crippled the city and forced its inhabitants to flee, that Bam's downfall began. Existing in shadows of its own historical greatness from 1722 and 1890, the city eventually closed its illustrious gates to civilians at the turn of the century. For the forty-year period following, the city was an active military barracks, and then lay vacant until the restoration process began in the early 1950s. A moment is all it will take for you long to realize that Bam is an extraordinary historical site. Many of the well-visited historical sites in the world, such as the Acropolis in Athens and the Coliseum in Rome, only give the archaeologist and tourist a limited slice of history. Bam, on the other hand, clearly displayed the imprints of over 2000 years of continuous history. Surrounded by inhospitable deserts and mountains, the Arg-i-Bam seemed to shine out amongst its inhospitable surroundings. When you strolled through front gates, you came face to face with ancient Bam. Houses, schools, mosques, gymnasiums, and bathhouses stand in the same places they did centuries ago. These structures maintained their allure, and they had the rare ability to give visitors a most inspiring adrenaline rush at first sight. Mud and sand stone buildings held much of their original shape. Little imagination was required in viewing the site and grasping how these people went about their daily lives. The superb archways and narrow dirt paths between apartment blocks, shops, markets and mosques provided the privacy and intrigue that made this historical site Iran's most treasured. Cold, Illness, and Trauma Stalk The Children of Bam UNICEF relief workers on the ground in Bam say that children who escaped the earthquake are still facing a major struggle to survive. Thousands of children are without proper clothing and shelter, exposing them to severe cold at night. Cases of diarrhea are on the rise as children drink dirty water. And the clean-up effort in devastated Bam is kicking up so much dust that children are beginning to suffer from acute respiratory infections. A surveillance system has been set up with the help of the UN to track the spread of illness.